For the last 20 years we have been selling water pumps and in that time I have come to expect service issues at one time or another usually on a weekend. The service life of the best available quality components is usually about 8 to 10 + years. From my experience I highly recommend if you can afford it to purchase one of our dual pump systems which due to the incorporation of the CSV (Cycle Stop Valves) have the smooth even performance of a VSD (variable speed drive) from minimum demand to full capacity of both pumps at once should the need arise. The CSV pressure controlled dual pump systems we offer have three advantages over a single pump system. Reliability. With redundant components we are ready for the failure of a critical component. Efficiency. Since one single pump is sufficient most of the time much less power is needed. Due to recent technological advances it has become economical to install two pumps side by side in tandem operation to provide several clear advantages over the conventional single pump system. 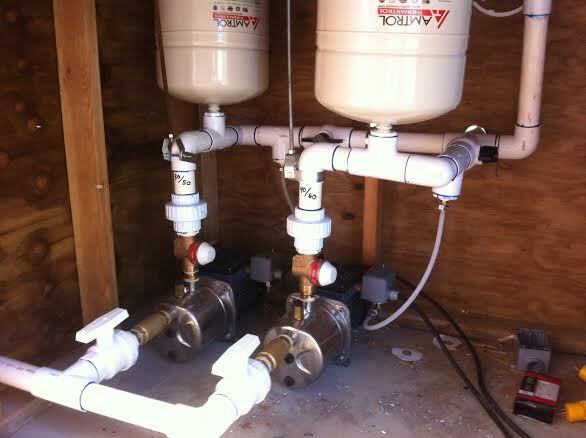 Dual pumps provide a complete redundant back up of all vital components. If any critical component in a pump system fails the water system is compromised and often will not supply adequate water. There are several necessary parts of a water supply system. The water pump, electric motor and power supply, check valve, pressure tank and controller are all critical. To provide duplicates of all critical components a 2nd pump is installed and instantly available should the first system fail at any time. This provides security for the owner knowing that he can be anywhere and know that his family or tenants will not be without the water supply. When two smaller water pumps are installed most of the time only one pump is operating using much less power than a single larger pump. EG. A ½ horsepower pump uses about 375 watts and runs 3 things at the same time. Most of the time that is sufficient to meet the demands of a small household. One smaller pump uses only half the power of a larger pump saving electrical power the majority of the time. These systems have proven efficiency in PV systems on Maui. Another good advantage of installing two identical pump systems in tandem is that if for any reason the capacity of the master pump is reached the secondary pump automatically engages and meets the increased demand up to the full capacity of both pumps.